Effective March 1st, Influenza vaccine required for boarding. Prescription refills are for our current clients only. In most cases, refills will be ready in 24 hours. If you need your pet's prescription sooner, please call! Check out our online store for a trusted and reliable place to fill your pet meds and pet food. Shop with confidence and security! "Where We Treat Pets Like Family!" We are a team of dedicated, compassionate and knowledgeable veterinary professionals working hard to provide the highest level of care for dogs and cats in Indianapolis and surrounding areas. We understand that every pet has a concerned owner, so rest assured that patient care and client satisfaction are top priorities for us. If you are already a client of Michigan Road Animal Hospital at 96th Street then please know we feel privileged that you have chosen us as your trusted veterinarian. If you are not yet our client, and are looking for an experienced veterinarian in Indianapolis, we welcome the opportunity to show you all that we have to offer. We are proud of our animal loving staff and new facility located on the northwest side of Indianapolis, IN. 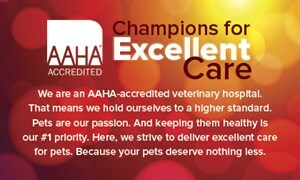 As part of our dedication to excellence our hospital is accredited by the American Animal Hospital Association. AAHA accreditation means we have met or exceeded their high standards of care regarding quality of medicine and surgery, accurate & secure medical records, as well as hospital design and equipment. Beyond first rate pet care our animal hospital provides a comfortable, friendly environment for pets and their owners. We offer a broad range of veterinary services to our patients and pay particular attention to disease prevention and wellness. Through our preventative and wellness care, your pet receives a comprehensive "nose-to-tail" physical examination in order to establish his or her overall health. We use a personalized approach to high quality pet care based on you and your pet's lifestyle. In addition to general wellness examinations and vaccinations, our hospital offers the latest advancements in internal medicine, surgery, dental care and diagnostics. Our state-of-the-art northwest Indianapolis facility allows us to treat most medical and surgical cases in-house. If your pet needs an emergency veterinarian in Indianapolis, we provide those services during normal business hours – contact us right away at 317-228-0645 for immediate assistance. For emergencies outside of our hours, please click HERE to find a nearby recommended vet. Michigan Road Animal Hospital at 96th Street offers full boarding services and medical boarding accommodations for pets requiring medical attention. When you have to leave your pet somewhere overnight, leave him or her with us where they will be in a safe and caring environment. There will always be a vet available should your pet have medical issues. Cats are kept in a quiet, comfortable area, while dogs are kept in a special dogs-only area. Our wonderful kennel staff will walk your dog outside daily and provide your pet the loving attention they deserve while you are away. Click here to learn more about cat & dog boarding. If you have been looking for a knowledgeable and experienced veterinarian in Indianapolis, we are confident our animal hospital provides everything you have been searching for and more. Meet our team of doctors HERE, and don’t hesitate to stop by today for a tour of our facility! 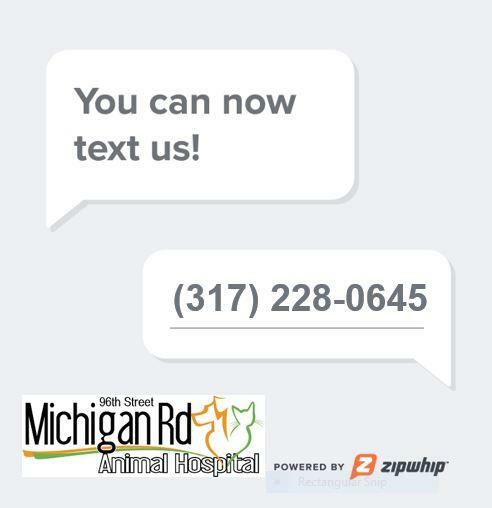 Here at Michigan Road Animal Hospital at 96th Street, "We treat your pets like family!" We provide care for pets from all over Indianapolis and the surrounding areas such as Zionsville, Westfield, Washington Township, Pike Township, Carmel, and East Brownsburg. We are proud to be one of the best veterinarians in the city!